There’s a craze sweeping our nation, and that’s wild swimming! However this goes beyond dipping your toe in the sea, wild swimmers are serious. Come rain or shine and whatever the season they hunt out the hidden coves and idyllic rivers then dive in and swim! With chlorine free waters, healing salt water and stunning views its no wonder why people are taking the plunge. Whether for charity, with friends, or for a peace and escapism it can be hard to find in an indoor pool. The health benefits have been known for decades - soothing aches, relieving depression and boosting the immune system - and releasing plenty of natural endorphins, our bodies happiness drug. NASA’s research showed that repeated cold swimming can bring down blood pressure, lower cholesterol and reduce fat disposition! If you fancy giving wild swimming a try then we have some brilliant swimming opportunities on our amazing Lizard Peninsula. Its worth noting, though if you are going wild make sure you are a strong swimmer and take the necessary precautions. There are plenty of lifeguard monitored beaches for those less confident or beginners. Kynance Cove - of course this is no secret spot, but Kynance Cover is ideal for the strong swimmer. You can swim at low tide in clear azure waters, head to the secret bay opposite Asparagus island, with its sea caves and rock pools. Known as Mermaids Pool, but only accessible at low tide - if you wander down onto the beach and walk around the headland to the other side. Once there, head to the far side of the rocks and nestled in there is a secret pool. Big enough to swim, deep enough to jump into and with crystal-clear turquoise water. But bare in mind the waters at Kynance can be troublesome, there is no lifeguard and you should always take note of the signs at the beach that advise on safety. The currents are more pronounced at low tides too. After some rigorous exercise you can head to the café for a hot chocolate to warm you up afterwards! If you choose the right time with tides you can also swim at Mullion Cove beach, Porthallow (popular for snorkelling and kayaks) and Porthoustock. Church Cove (also known as Gunwalloe Cove) is patrolled by lifeguards during the summer months of July and August. Flags are put out to note the area acceptable to get in the sea. But take care, there are strong currents here especially at low tide so outside of these months swimming here is not recommended. If you haven’t done much wild swimming before stick to the lifeguarded beaches, do your research and come prepared. Always swim on an incoming tide. 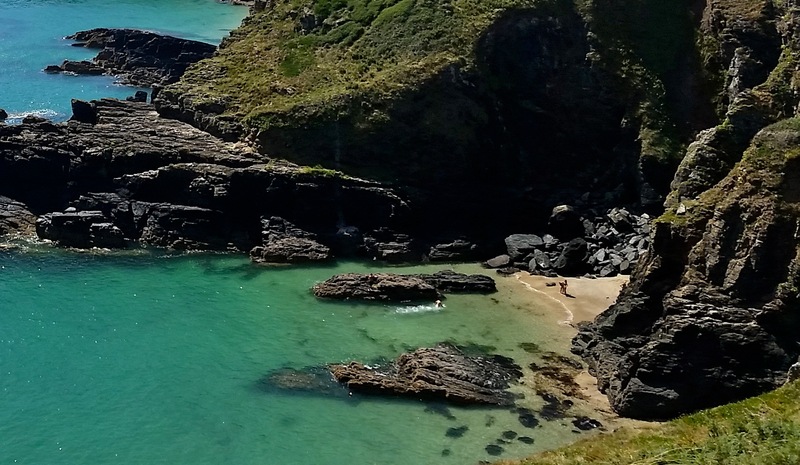 The views are spectacular, the water crystal clear, what better way can there be to experience wild Cornwall - but watch out, once you start on the wild swimming adventure it can become quite addictive!